The earliest and, I am convinced, most distinctive influences on that classically American stage and film director, Elia Kazan, were the creators of the Group Theater: Harold Clurman, Cheryl Crawford and Lee Strasberg. All three, in turn, were living and creating a new American theater under the awesome shadow and influence of Constantine Stanislavski’s Moscow Art Theater. A few of these Group Theater Americans had, in the 1930s, even visited Moscow to view this new form of realism in, by then, Soviet Russia firsthand. The Group Theater’s rather mystical influence on myself first came from Harold Clurman and his writings. At Dartmouth, studying as a major in drama, where I spent most of my time in that college’s two theaters, Robinson Hall and Hopkins Center, I had eagerly read Clurman’s book about the Group Theater, The Fervent Years. I finally met Harold Clurman in New York months after my first Broadway success as an actor in the John Hopkins’ play, Find Your Way Home. Harold couldn’t help making it clear, despite my having won a Tony Award for that performance, that he would have directed me differently. While listening, I nodded in some sign of respectful recognition and did my best to thank him for some advice I didn’t really ask for. Eventually Harold’s former wife, the legendary acting teacher, Stella Adler, was ultimately the greatest Group Theater influence on me. Not because I had ever studied with Stella Adler. I had been given, for better or for worse, my acting technique in London, England. Stella, however, approached me, entirely on her own, and, in the midst of a very bad time in my career, personally expressed her admiration for me as an artist. Stella had even some remarkable words to say about me in People Magazine. Or was it Today Magazine? I can’t quote her words because it has been so long since I read them and I haven’t been able to find a copy of that issue… nor can I recall the time it was published or remember the exact words she’d said to her interviewer. Praise from Stella Adler in print, however, and at that moment particularly, was the vital medicine I needed to keep me going, to keep me plodding on in the increasingly strange and painfully unfriendly businesses of stage, film and television. Marlon Brando had always paid great respect to the influence that Stella Adler had on him. She was the only acting teacher he would acknowledge as his. That alone placed Stella, in the eyes of most admiring talents in the American Theater, way above what I consider to be the overly exaggerated and so-called “genius” of Lee Strasberg. I never asked Harold Clurman about Marlon Brando. The most legendary actor he had ever directed. I never asked Stella about her having been Brando’s principle acting teacher. I later avoided even meeting Marlon Brando himself at the studio filming Report To The Commissioner. He had visited the set as a close friend of that film’s screen writer, Abby Mann. It was on the lunch hour and I made sure I wouldn’t be there. Despite the fact that Brando was all every actor in the English-speaking world ever heard about! What about Laurence Olivier whom I had already seen live in his astonishing performance as Othello?! Or Paul Scofield as Don Adriano de Armado in Love’s Labor’s Lost at Stratford, Ontario?! Or, most memorably, William Hutt in the Canadian Players production of King Lear?!?! Well… so much for trying to avoid the elephant in the room. There would be no Biblical “David”… not even James Dean qualified… to cut this acting monster called Marlon Brando down to size. Even Brando’s own efforts to ruin his own career with his own, deliberate obesity?! Not even that could erase the depth of his achievements. Brando’s glory days under the direction of Elia Kazan were actually resurrected and reaffirmed by his later appearance as a portlier Godfather. As the Godfather of American acting, Brando’s authority as Don Corleone had his supporting cast not having to “act” their reverence and awe for The Godfather. The director, Francis Ford Coppola, simply cast Brando and the “pecking order” instantly fell into place. This second article of my new essay series, The Interlude, concentrates upon the profoundly unique chemistry that was created from the moment in which Elia Kazan and Marlon Brando began working together. 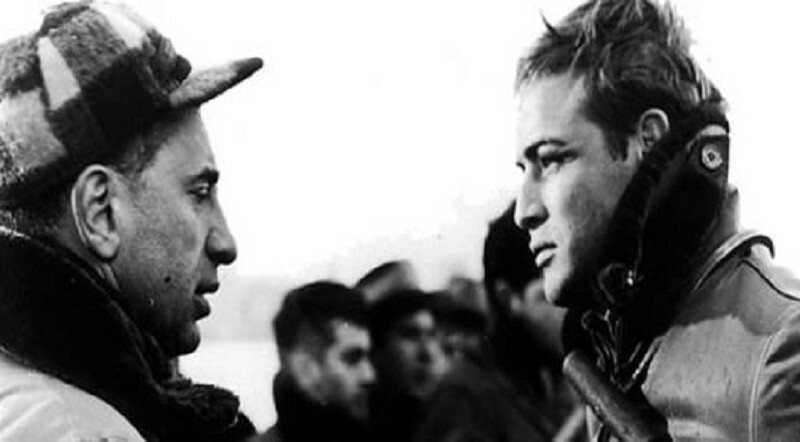 Kazan had first produced Brando before directing him. Elia Kazan as Producer and Harold Clurman as Director, having, I suspect, heard about Marlon Brando from Stella Alder, cast Brando in a Broadway production of the ill-fated play,Truckline Café. The embarrassingly short run of that play left Marlon Brando the only new event that anyone, who had seen the play, talked about. Brando’s next appearance on stage under Kazan’s all-important, personal direction, in Tennessee Williams’ Streetcar Named Desire, confirmed him first as a major new heartthrob on Broadway and then, with his subsequent 1950s film appearances, as an indisputably charismatic film star. Ultimately Brando, I believe, became perhaps Hollywood’s most stunning movie star, running neck and neck with even the great silent movie legend, Rudolf Valentino. With Kazan’s direction, Brando’s stardom swiftly cast so huge a shadow over American leading men, that subsequent stars such as James Dean, Paul Newman and Robert Redford?! Brando somehow made them all look like lightweights. His range of appearances on film left the critical world with no other choice but to rank Brando’s record-setting star quality as merely the frosting on a multilayered cake of acting genius. Nothing, however, was more important to the Brando legend than Elia Kazan’s indispensable contribution to it. 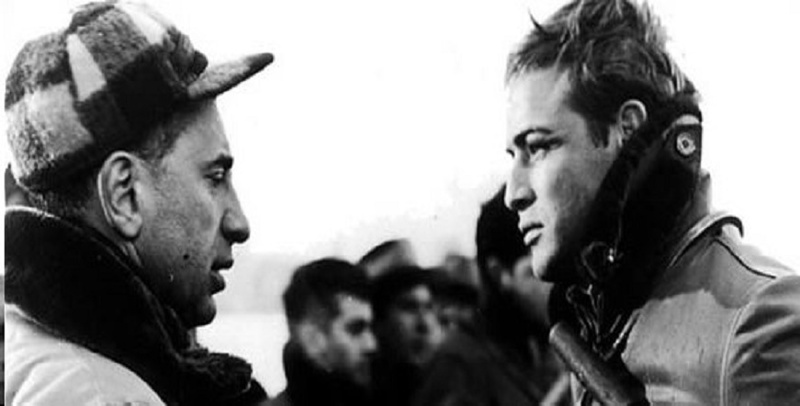 The Kazan collaboration with Brando eventually spawned an extraordinary trio of films from the debut of Streetcar Named Desire in 1951 to the appearance of Viva Zapata in 1952 and then to Kazan’s and Brando’s unsurpassable cinematic masterpiece: On The Waterfront in 1954. My two favorite Kazan films? On The Waterfront and the film I concentrated on in my first article for The Interlude, East of Eden. Both works are in my list of the Top Ten Films of All-Time. With Budd Schulberg and John Steinbeck as the creators of these two, quintessentially American classics? Each taking a microscope to American souls within the two farthest corners of the American continent: the 20th Century Brooklyn waterfront and the pre-World War I mysteries of Monterey, California? No two films that I know of, could introduce the essential soul of America and Americans with more density, power, naked honesty and limitless emotional range than East of Eden andOn The Waterfront.